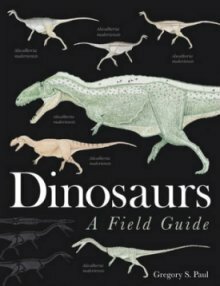 The first authoritative book on dinosaurs in the style of a field guide. Descriptions of over 700 dinosaur species by renowned expert, Gregory A Paul, are illustrated with over 600 colour and black-and-white images, including anatomical reconstructions and skull diagrams. The extensive introduction begins with the simplest and most useful questions – ‘What is a dinosaur’ – and goes on to treat a wide range of topics from taxonomy, evolution, biology and behaviour to a discussion of fossil discoveries and palaeontological research. You can even imagine a trip back in time to see dinosaurs – ‘Dinosaur Safari’. The bulk of the book is devoted to full treatment of the five dinosaur groups: protodinosaurs; predatory dinosaurs and protobirds; prosauropods; sauropods; and ornithiscians. After each family introduction, the species text includes biometrics, fossil remains (proportion of full animal recovered and sites at which specimens have been found), age, distribution and formations, habitat (where known), and habits (mainly based on anatomical features). The level of knowledge about species varies considerably and this is fully reflected in the species accounts. A fascinating insight based on the most up-to-date knowledge on dinosaurs that would make a great Christmas present.